Every birder wants the best optics possible. But what that means often depends on circumstance. I love my Swarovski EL 8x32s deeply, but sometimes they might be inconvenient, ostentatious, or just too bulky for the occasion. As you can see, the Traveller’s compact size made stealth packing a breeze. Its feathery wieght – the website lists it at 13.4 oz, while my kitchen scale gave it 13.25 without a strap or lenscaps – meant that I barely noticed lugging it around Lake Placid all day and the reception all night. Though I did not get the chance to test it in truly extreme conditions – rainstorms, say, or a tossing boat – the Traveller performed extremely well on a gentle slope after a glass or two of wine. (Yes, mom, I also tested them when I was sober!) In particular, I was very pleased with the brightness of the images I was getting and the performance in low-light conditions. The field of view was not cramped, even when judged against my loyal Swarovskis. And these little troopers also have the ability to close focus at under five feet, great if you find the most confiding warblers in the world or want to have a go at butterflies and odonates. My complaints were few and mostly limited to the physical constraints imposed by size. Most notably, I found it irritating to have a focus wheel that needed to be worked by my ring fingers, while my index fingers pressed uselessly at the hinge lock. The angle at which I had to hold the Traveller to my face felt just odd after a lifetime of using standard-sized binoculars. A person with larger or meatier hands than my own might have difficulty with these guys. I wouldn’t trade my Swarovskis for these full-time, but come on. At a much lower weight and price point, there’s no doubt that the Traveller is a quality pair of binoculars. 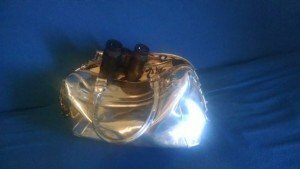 I expect it to find a wide audience, not only among its namesakes who need to pack light, but also with folks who have physical limitations that prevent them from handling a heftier piece of equipment, and any birders who want a grab-and-go pair for a cramped office, glovebox, or day bag. 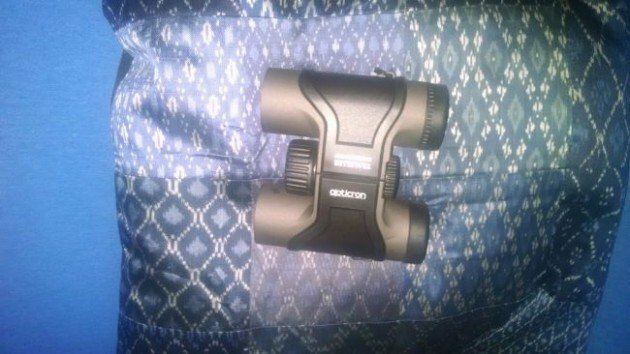 Read more about the technical specs of the Traveller BGA Mg.
Opticron kindly provided some of their equipment to 10,000 Birds for review. They are also an advertiser on the site as of the posting of this review. Neither their equipment nor their advertising influenced this review.